Just days before turning 29, Tim Cigelske decided he wanted to do something special for his 30th year on the planet. The Marquette University communications specialist (read: social media expert) asked his Twitter followers, and the answer came quickly: run a mile and drink a beer every day. The challenge made perfect sense for Cigelske. In his spare time, he writes Draftmag.com’s Beer Runner blog, which chronicles the intersection of lacing up the Nikes and leaning back with a brew. More than 260 days later, he’s still going. Cigelske spoke with Wired.com about running at 11:30 p.m., the proper pint-to-mileage ratio, and why he might never stop. Wired.com: How did this whole adventure begin? 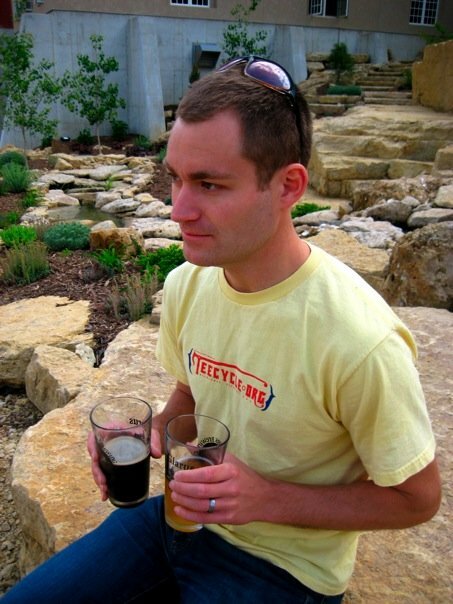 Tim Cigelske: A day or two before my 29th birthday, I thought “Maybe I should do something for the next year.” I threw that question out on Twitter, and one guy said, “Why don’t you run and drink beer every day for the next year.” That sounded reasonable at the time. I didn’t know what I was getting myself into. Two hundred and sixty days later, here I am. Wired.com: What have you learned? Cigelske: One thing I learned is that I could even do something like this. I tried one other run streak that lasted about 20 days, and then I fell asleep early one night. (That was shortly after my daughter Clara was born.) I’ve been running since high school, but this is probably the biggest challenge that I’ve ever tried. The other thing I’ve learned is how much support there is from Twitter, Facebook, Daily Mile, Untappd, and other bloggers. I’m not sure I’d keep doing it if it weren’t for all the people that have shown support. It sounds incredible corny, but it helps so much to know that I’m accountable. I wrote an April Fool’s column about stopping the run streak. It was loaded with references to beers that didn’t exist, but there were a lot of people who didn’t know I was joking. I had to tell them to check the calendar. Wired.com: Was there ever a time when you thought you weren’t going to be able to finish? Or, conversely, a point where you knew you could do it? Cigelske: The plan was always to do it for a year, and as it’s gone on, I’ve realized that I want to keep doing it after a year. It is a little bit premature because I haven’t made it to a year yet, but that’s the plan. If you’re a runner, it’s almost easier to do a run streak than not because it removes the whole element of “Am I going to run today or not?” which is a lot of wasted mental energy. I have a routine; I know I’m going to do it every day. Now, on day 260, I want to keep going indefinitely. Funny enough, there’s an official run streak organization and you can apply for membership after one year. There are people who have done it for 30 years. I don’t what to jinx it but knock on wood I’ll keep going after the year is over. Wired.com: My favorite runs are the ones where you trace out a number, like 100 on your 100th day or 250 on day 250. Where did you get that idea? Cigelske: I totally stole that idea. It’s become a Daily Mile meme. The first person I saw do it was a guy named Marty (@mjburian on Twitter). He just finished a 50-mile race recently, and he wrote out his name by running streets. And I’ve seen Jonathan Surratt (@beerinator) do it. He’s written out “beer.” So I just took it another step. One hundred and 150 were pretty easy. Two hundred and 250, that took some creativity. Wired.com: You recently said you would run a beer mile if 30 people pledged to do a five-day run streak. Are you ready for the beer mile? Cigelske: That was a partnership with Bolder. They came to me, we discussed some options, and we tried to get 30 people to do a run streak for five days. We got 60, and people are still going. One guy, after 20 days, decided to do 20 miles. It was kind of a shock that it took off. Now I have to make good on the beer mile part. I’ve done it before, but hopefully I’ll survive. Wired.com: What’s the closest you’ve come to missing either a mile run or a beer? Cigelske: I ended up running on a treadmill at 11:30 p.m. in New Jersey one night. My plan was to run straight through past midnight so I basically got two days in one. But halfway through my run, I realized I hadn’t had a beer yet for the day, so I cut my run short, went up to my hotel room and cracked open one of the beers I brought with me, just in case. I had a couple of beers because I met some friends at a bar, went back to the treadmill, and ran a couple miles at 1:30 a.m.
Wired.com: Any memorable beer-and-running combos? Cigelske: I haven’t done a ton of races, but there was a 5K I did, and it was the fastest I’d run since high school. The night before I had a bunch of beers, including the New Glarus Wisconsin Cran-bic. I think the fruit-and-carb infusion helped. I typically drink after my runs, but I’ve been known to have one before. One day I was feeling really run down at the end of a long week, and I thought I’d go out and have a couple of beers at happy hour. I ended up running an hour after that and felt great. Wired.com: Is this the best shape you’ve ever been in? Cigelske: If I’m not in the best shape of my life, I’m definitely close. I’ve never felt better. I’ve built my way up to running about 50 miles a week with no problem, on top of biking to work every day. But it took months to get to this point. I try to vary my workout routines as much as possible. I’ll do 13 or 14 miles with my daughter in her stroller one day and do interval workouts another. I recently did mile repeats on the track and averaged a 5:33 mile, which I think is the fastest I’ve run since high school. At the same time, I’m averaging about one beer for every three miles I run. If nothing else, running allows me to enjoy the beer I love guilt-free. That was the point all along.